The US and Russia have announced that a planned cessation of hostilities in Syria will come into effect at midnight on 27 February. Their statement said the truce did not include so-called Islamic State (IS) and the al-Qaeda-linked Nusra Front. World powers agreed on 12 February that a truce would come into effect within a week, but that deadline passed and scepticism remains over the new plan. On Sunday 140 died in bombings in Homs and Damascus as the violence continued. More than 250,000 Syrians have been killed in the conflict which began in March 2011. Some 11 million others have been forced from their homes, of whom four million have fled abroad - including growing numbers who are making the dangerous journey to Europe. 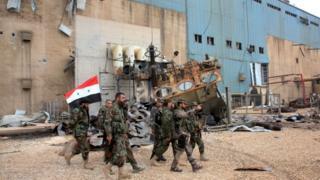 Separately, Syria's government has called a parliamentary election for 13 April. The last was in 2012 and they are held every four years. The White House said that President Barack Obama had phoned his Russian counterpart Vladimir Putin at Mr Putin's request to discuss the efforts to establish the cessation of hostilities. After their phone call, the joint Russian-US statement was released. The truce applied to "those parties to the Syrian conflict that have indicated their commitment to and acceptance of its terms", the statement said. This excluded IS, Nusra and "other terrorist organisations designated by the UN". Air strikes by Syria, Russia and the US-led coalition against these groups would continue, the statement read. It said that armed opposition groups taking part would have to confirm their participation by midday on 26 February. Russian and Syrian planes would halt any attacks on the armed opposition groups. Russia and the US will work together to "delineate territory where groups that have indicated their commitment to and acceptance of the cessation of hostilities are active". Syria's main opposition grouping, the High Negotiations Committee, said it would accept the truce, but its commitment was conditional on the lifting of sieges, an end to attacks on civilians, the freeing of prisoners and the delivery of aid. US Secretary of State John Kerry welcomed the deal, saying: "If implemented and adhered to, this cessation will not only lead to a decline in violence, but also continue to expand the delivery of urgently needed humanitarian supplies to besieged areas." Russia and the US back opposing sides in the war; Moscow is President Bashar al-Assad's strongest ally. On Saturday, President Assad had said he would be ready for a ceasefire, if what he termed "terrorists" did not take advantage of the lull in the fighting. But he had previously cast doubt on the success of a truce. Image caption A new UN inquiry demands an end to "indiscriminate attacks on civilians"
Analysts say there will be huge scepticism about the possibility of an effective ceasefire, given the current fighting and failure of the first deadline. Air strikes will continue and it is unclear whether Kurdish forces, which have been making ground in the north, sparking artillery fire from Turkey, will abide by any truce. The UK-based Syrian Observatory for Human Rights monitoring group said fighting and air strikes continued unabated on Monday, with IS fighters attacking the army's main supply route between Damascus and Aleppo. Islamic State militants said they carried out the attacks in Homs and Damascus on Sunday. Russia said the attacks were aimed at "subverting attempts" to reach a political settlement. On Monday, a spokesman for the US-led coalition fighting IS in Syria, Col Steve Warren, said he believed that IS was "beginning to lose". He said the number of Islamic State fighters in Iraq and Syria, previously placed at between 19,000 and 31,000, was now between 20,000 and 25,000. "They have been able to replenish their forces at roughly the same rate as we've been able to kill their forces. That's hard to sustain," Col Warren said. Syria is a "fractured state on the brink of collapse"
The international community must "curb the proliferation and supply of weapons to warring parties"
"Indiscriminate and disproportionate attacks on the civilian population must end"